This form is to help get information about students present levels of performance in the general education classroom. I use this as it is formatted to help answer the areas found in the IEP online system. I have also included a second present levels of performance that is for TK and Kindergarten. Form to collect data from general education teachers to include in IEPs and/or progress reports. I needed a form to give to my general education teachers for students I rarely see. I added everything I thought I needed. You may edit it completely for what you need. Change the school logo. Even the watermark if you do not like blue. Product can be emailed to teachers. This packet is designed for you to go in and add your measures that you use for each CCSS. 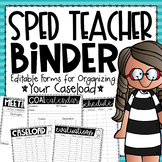 Take it to meet with your general education teacher prior to writing IEPs for quick and efficient conferences. 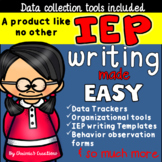 Template of items to include in the Present Levels of Performance to write a solid IEP. Special Ed. Present Level of Performance - Teacher Doc. This is the form I like to use when requesting information from teachers about my special education students. This form covers all areas needed when developing Present Levels of Academic and Functional Performance for a student's IEP. 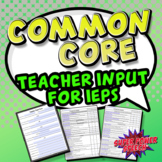 Use this form to gather information from the general education teacher for an upcoming IEP. This form specifically addresses English domains. This form is a great tool/graphic organizer to ensure that teachers cover all areas of a child's education in either an IEP or in a write up. Hope it is a time saver for you! 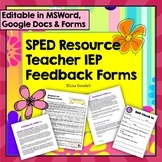 This form is used to help special education teachers develop IEPs. It is intended for the classroom teachers to complete to help get present levels of performance in the general education classroom. This is a template for the PLAAFP that students receiving special education services must have. The Present Levels of Academic Achievement and Functional Performance template lists the areas required review.